Singers- The freedom of memorized music.- How to. Push yourselves singers, to memorize. There is a whole level of development both musically and character/theatrically to be delved into that CAN NOT EVEN BE TOUCHED until your song is COMPLETELY memorized. Take the time to push yourself through the memorization process as trite as it may feel. Everyone memorizes differently. Things that helped me were recording myself and it is best when it is yourself) singing through a piece and listening to it over and over. Also record yourself speaking the lyrics of your music in a poem and listen often. The other thing to do when you have challenging rhythms is to record the text to the rhythms to a metronome without singing. Just speak the correct rhythms. You can even speak out the rests in your recording (in time). Quarter, dotted half note... or 3 and 4 and. 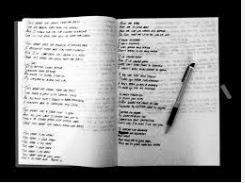 To relieve the boredom of memorization try and speak your lyrics like a rap emphasizing key words. Try and say the lyrics as fast as possible. How quickly can you get through them without hesitating? Feel free to notate breaks. Say your lyric stanza then say 2 measures, or 16 measure break, or wait for the low G etc... In speaking form you can memorize the process and structure of the piece you will sing. Writing the lyrics is another huge help. Write out the whole piece. Put the measures or counts that you need in as well. Seeing the writing you put on the page can be really helpful in memorizing. Also, when you are looking at it on paper you can see the patterns, which words repeat, what is different, or what rhymes. Highlight, color code anything to memorize the different patterns in a piece so you have an easier time. You can color code your beats to a piece, the emotions, and the dynamics. Read this piece that YOU HAVE WRITTEN over and over so you are visualizing what you are saying. The faster you get through the memorization the sooner you will be free to dive into the true making of the music, become the song and its character with its moment. It will be like taking flight to a song. Also, you just will seem more professional and hire-worthy when you show up memorized. Push yourself singers to be your best. There will be someone else out there pushing themselves always, and you will be compared. Go, GO!